Transform your room into a club, AMLIGHT ultraviolet LED Black Light is designed to ignite the passion and release energy your heart desires, unconsciously, dance with the music in this particular light. We can help you to locate dry stains invisible to the snake eye. Simply point, shine and find with AMLIGHT lamp. Fixture Dimensions: 22.8" x 1.43" x 0.9" . LOWER MAINTENANCE COSTS: 40,000 hours rated life time, lasts up to 36 years (3 hours per day), and equivalent to 20-Watt light output using 7.5 Watt only, save up to $55 over the life time of the fixture. DO NOT USE this fixture with a dimming circuit; however, it can be used with a switched outlet. Per the National Electric Code (NEC), switched wall outlets cannot be used with wall dimmers. ★ADD PERFECT AMBIENCE TO YOUR HOME: Ignite the passion and release energy your heart desires, ultraviolet light style your home needs! Reminiscent of lights seen in France's romance and Switzerland's leisure life, unconsciously, dance to the music in the grow lighting. 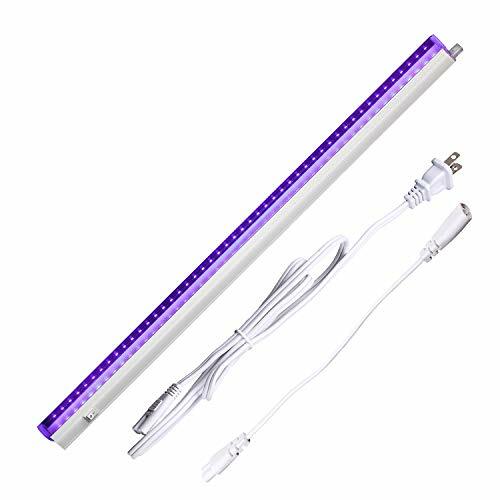 ★MULTI PURPOSE & EVERYDAY USE: Widely for architectural decorative lighting, boutique atmosphere lighting, applicable for spot Insects, authentication currency and certificates, hotel room inspection and mobile DJ. ★TOP-NOTCH QUALITY: ETL UL Rated for long-length or wide-area applications, 48pcs high brightness Epistar SMD2835, Japanese high transmittance PC Cover, aviation housing with high-grade PCB board for outstanding heat dissipation, constant current driver for the safety and convenient maintenance. 395-400nm Wave length, no harmful to retinas or skin. If you have any questions about this product by AMLIGHT, contact us by completing and submitting the form below. If you are looking for a specif part number, please include it with your message.